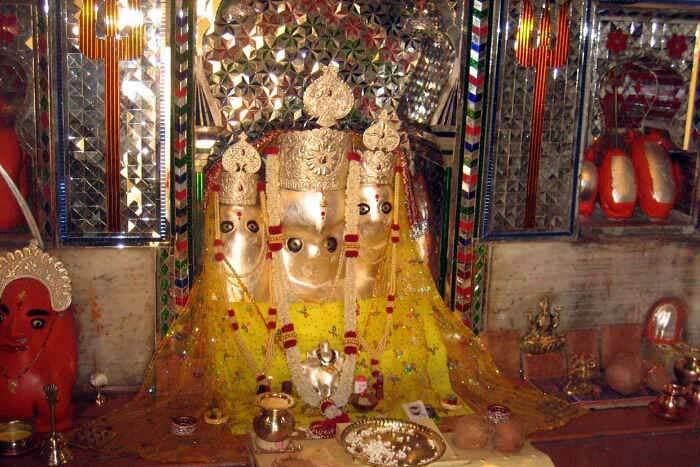 Baglamukhi Mata Ji Temple at Nalkheda in Madhya Pradesh is a temple whose legend is associated with the Mahabharat. The temple is located in a graveyard and it is believed that the Yudhishtira, the eldest of the Pandavas, installed the murti of Baglamukhi Mata Ji on the 12th day of the Kurukshetra battle. This was done on the advice of Sri Krishna to attain victory in the Great War in the Mahabharata. The temple is around 105 km northeast of Ujjain. This is an important Siddh Peetah. The popular belief is that there is only three ancient temples dedicated to Baglamukhi Mata and the Nalkheda Temple is one among the three. The other two temples are located at Datiya in Madhya Pradesh and Kangara in Himachal Pradesh. The murti of Goddess Baglamukhi at Nalkheda Temple is Swayambhu – divine appearance. The deity worshiped here has three faces. Thus, she is also known Trishakti Mata. An important center of Tantric worship, the shrine is on the banks of Lakhundar River. The subsidiary deities worshipped in the temple are Bhairava, Hanuman, Sri Krishna, Goddess Lakshmi and Goddess Saraswati. For victory and desire fulfillment, people perform yajna, havan and pujas here. The present temple was renovated in 1815. The most important day in the temple is the Baglamukhi Jayanti observed in Vaishakh month. Another important festival observed here is Navratri.